Donald Trump’s visit to NATO headquarters last week was consistent with two of his foreign-policy views: the need to pursue close relations with Russia, and skepticism about NATO’s utility. Despite affirmative comments about NATO from his secretary of state and Vice President Mike Pence, Trump persists in accusing NATO members of failing to pay the “massive amounts of money” he says they owe. Rather than reaffirm the US commitment to NATO’s collective-security principle, as its ministers had expected, Trump offered a lukewarm promise “never to forsake” America’s friends. Forgive them is they feel forsaken, or at least undercut, in favor of Putin’s Russia. Trump’s criticism of NATO’s military spending is hardly new—previous administrations have said the same—but it ignores four points. First, NATO members have made important troop commitments in support of US policy—in the Balkans, for instance, and in Afghanistan—and are active in intelligence gathering and sharing on terrorism. Second, merely jacking up military spending, particularly in order to buy US-made weapons or justify further US contributions to NATO, may be welcome to the US military-industrial complex, but it doesn’t by itself strengthen the organization. 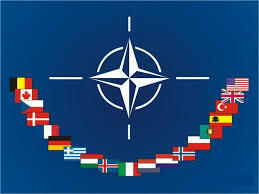 Third, NATO’s twenty-eight European members need to reevaluate the strategic purposes of greater spending. For example, occasional military deployments in the Baltic states and Poland to show solidarity may be in order, but hemming Russia in (see the figure below), which the Pentagon has pushed under Obama and now Trump, and which the Europeans enthusiastically endorse, is needlessly provocative. These troop rotations and exercises exacerbate tensions with Moscow, lead to Russian counteractions, and raise the risk of accidental war. Fourth, and most fundamentally: Does more military spending buy more security? The European members of NATO have every right to consider their own domestic agendas when deciding on how and when to meet the 2-percent goal. For them, terrorism, employment, immigration, and environmental protection count importantly in national security. Germany and France, for instance, fall well short on NATO spending; but the success of their economies is critical to the European Union’s future. Greece, on the other hand, is one of the four EU countries that meets the 2-percent mark. But why should Greece devote 2 percent of GDP to the military when it still is in a financial crisis, is deeply in debt to the EU, and does not face an external threat? Trump’s qualified embrace of NATO and his persistent refusal to criticize Russia’s behavior may eventuate in some kind of distancing between the US and Europe. Reflecting German exasperation with Trump, Der Spiegel, in a blistering critique of Trump’s moral and intellectual deficiencies, offers five ways to deal with him. The last one is relevant to NATO: “the international community wakes up and finds a way to circumvent the White House and free itself of its dependence on the U.S.” (www.dailykos.com/stories/2017/5/26/1666273/-German-newspaper-rips-Trump-calling-him-unfit-and-a-danger-to-the-world). In light of Russian intervention in Ukraine, Crimea, and Syria, a rift in the alliance could not come at a worse time. And how bizarre, that Trump should be so solicitous of Saudi Arabia and Israel, yet so brusque with the Europeans. Note that the 2% GDP Greek defense spending is down sharply from the 6% level of the 1980’s This is a small point, Mel, but it does suggest that the rationales for military spending among NATO countries are idiosyncratic–and cannot be understood exclusively in relation to prevailing assessments of current security threats. Three-quarters of the Greek military budget goes to personnel and to cut those salaries further in the current economy would be impossible, politically.